Slow Cooker BBQ Pulled Chicken - a delicious and flavorful entree that is the perfect solution for a simple weeknight meal. It's been a couple of years since I last shared my recipe for Slow Cooker BBQ Pulled Chicken, so I decided today would be a great day to re-visit and take some fresh photos. I think one of my favorite things about this meal (aside from how yummy it is) is that it is REALLY easy to make, perfect for a busy weeknight. And, pulled chicken is a much healthier option, compared to pulled pork ... which is an added bonus! Step 1: Place the chicken into your slow cooker, and cover with approximately half of the BBQ sauce. Cook for 3-4 hours on the low setting. Step 2: Remove the cooked chicken from the slow cooker and place on a platter or cutting board. Using 2 forks, gently shred the chicken apart to your desired texture. Step 3: Add the shredded chicken back into the slow cooker with the original cooking liquid, along with the remainder of the BBQ sauce. Mix well and allow to sit for 10-15 minutes. Serve with your desired toppings and bun - I always go for a huge helping of coleslaw and a soft kaiser bun. So, I am just realizing today that this delightful Silken Tofu Chocolate Pudding is my first EVER dessert post on my blog. I guess its just further proof that I am not really a dessert person. Not that I don't love a delicious treat every now and again, but making them at home is something somewhat foreign to me. My kids on the other hand, LOVE desserts, as most kids do. They are always begging me for treats, and asking when the next holiday is coming so they can anticipate getting more candy. I wanted to see if there was any chance at all that I could get them to eat a dessert that was both delicious and [somewhat] healthy. They [ages 3 and 5] tried the pudding, and on the first few bites said how much they loved it. But, I will admit that a few bites in they were done with it. My daughter did ask to take some in her lunchbox and seemed to eat more on the second go-around. Lucky for my husband and I, were were more than willing to lap up the leftovers! A quick note about the cocoa powder...when I made the first batch of this pudding, I used a standard baking cocoa powder. Since then, I have experimented with dark chocolate cocoa powder, which adds even more richness to the flavor. So, it's really up to your taste preference! Add all of the ingredients to the bowl of a food processor and process until it turns into a very smooth consistency. Refrigerate for at least 4 hours before serving. I discovered these mouthwatering patties about 10 years ago, when my future husband (at the time) and I were on a major healthy eating kick pre-wedding. We found an old Cooking Light cookbook, and began using it to gauge our nightly dinners together. They are a fabulous option for a meatless lunch, or dinner and they keep really well if you make a double batch so you can have leftovers. So, for the chickpeas (also known as garbanzo beans), I would strongly encourage you to buy the dried ones (as opposed to the canned ones) and prepare them like this: empty the contents of a 16 ounce bag of dried chickpeas into your slow-cooker. Fill the slow cooker with water, cover, and cook on high for 4 hours. Since all slow cookers distribute heat a bit differently, you may need to adjust the time a bit so that the chickpeas are fully cooked. Step 1: Heat one tablespoon of the oil over medium high heat in a large skillet. Add the onion and garlic, and saute until soft. 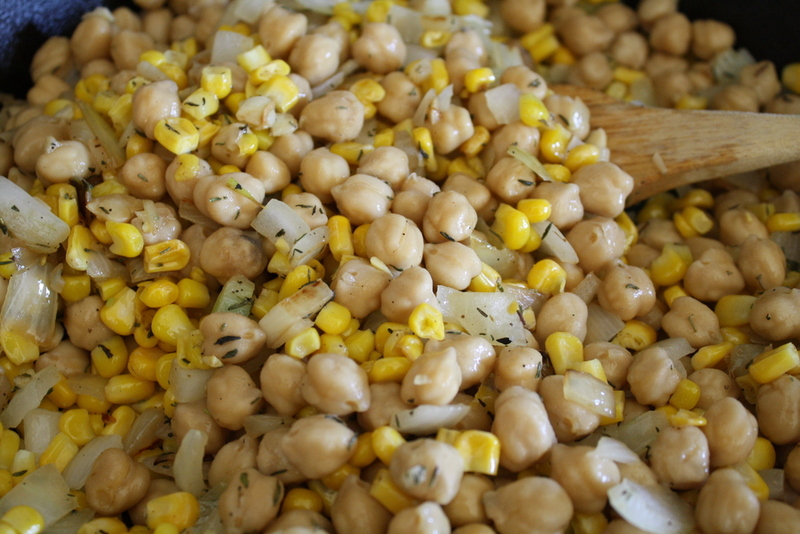 Add the corn, chickpeas, and dried thyme and cook for an additional 3-4 minutes. Step 2: Remove the skillet from heat and allow to cool a few minutes. Spoon the mixture into a food processor and pulse for 30 seconds. Then, spoon the contents into a large bowl and add the egg, cornmeal, salt, and ground red pepper. Mash with your hands and then shape into patties. Step 3: Heat the remaining tablespoon of cooking oil on medium high heat in a large skillet. Cook the patties for 4 to 5 minutes on each sideuntil nicely browned. Serve the patties topped with your favorite salsa and sour cream. Meal time (especially dinner time) can get stressful pretty quickly in my house. It always amazes me that my 2 kids start asking for dinner, sometimes as early as 5PM. Usually, the times when I have a simple meal plan in place are the days that I find running much smoother overall. I am a huge fan of mixing vegetables into the main course, especially when it comes to kids. In my own experience, I have found that my kids are much more tolerant of eating lots of veggies, or trying a new veggie, if they are mixed into something else. The whole "hidden vegetables" theory is genius! Step 1: Cook the pasta according to the manufacturer's instructions. Step 2: To make the sauce, add the butter to a saucepan over medium heat. Add the flour and chicken broth and cook until the flour dissolves. Then, add the milk, cheese, and spices. Continue whisking until the sauce thickens. Add the frozen peas, and stir into the sauce until thawed. **A couple of quick notes about incorporating cheese...in my opinion the best way to add more delicious flavor to your meals is to grate your own cheese. It takes a couple extra minutes, but I assure you that it makes a huge difference flavor-wise. To complete the dish, add the cooked pasta to the cheese sauce and peas mixture. Stir well to combine, so that the pasta is evenly coated with the sauce. Hope your kids enjoy this meal as much as mine do!! In my mind, Memorial Day marks the start of summer. And what is a better treat on a hot summer day than a cold and refreshing popsicle? This recipe for Strawberry Watermelon Popsicles has 2 ingredients, and they setup and freeze very nicely due to the high water content in the watermelon. In a blender, combine the strawberries and watermelon and blend until smooth. Pour the mixture into popsicle molds, and freeze (I typically freeze mine at least 4 hours). I have had a bit of a struggle lately coming up with healthy breakfast options for my family. We have been in a rut of eating the same scrambled eggs, English muffins, and bowls of cereal for too long. Hopefully these delectable (and versatile) mini quiches are going to solve that problem once and for all! Step 1: Prep your onion and garlic and pre-heat your oven to 325 degrees. Step 2: In a large sauté pan over medium-high heat, add the oil and cook down the onions and garlic. Add the spinach and cook down until spinach is wilted. Step 3: In a large mixing bowl, whisk together the eggs, egg whites, and milk - then gently mix in the cheese. Step 4: Spray a muffin tin with the cooking spray, then divide the egg mixture between the 12 cups. Then, spoon a bit of the sausage/spinach mixture into each of the cups. Step 5: Bake the mini quiches in the 325 degree oven for 25-30 minutes, until the tops are just starting to brown. Let cool on a wire rack for at least 5 minutes. Then, place the rack on top of the pan and flip it over to turn the quiches out onto the rack. Turn the rack upright and let the quiches cool completely. Note: These keep well in the fridge for 3 days. To re-heat, microwave for 30-45 seconds. My Parmesan Turkey Burgers are one of my favorite go-to weeknight meals. They are super easy to make, and so much leaner than a traditional beef burger. You can also play around with adding in sautéed veggies or fresh herbs. One of my favorite add ins is a mixture of sautéed mushrooms and red peppers. Step 1: Combine all ingredients in a large mixing bowl, and use your hands to mix everything together until well combined. Shape into patties, and prep your grill. I usually make these on my gas grill, prepped with a bit of grilling spray, on medium heat. You could also make them in a non-stick skillet coated well with cooking spray. Step 2: Grill your burgers until cooked through - I usually go with 4 minutes per side. Step 3: Adorn your burgers with your favorite toppings and bun selections and enjoy!